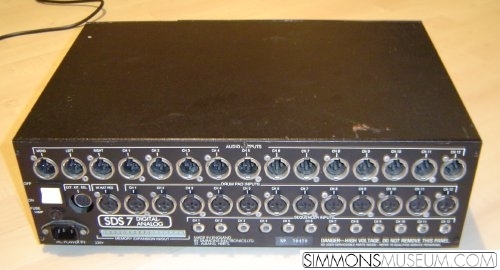 The SDS7 was the first Simmons offering a digital sound source beside the famous and well-established analog sound generation. Both "worlds" can be mixed. Each of the up to 12 modules carries an eprom with an 8 bit sound sample which can be edited with the well known and succeful analog filters. These sounds are taken from a Simmons library or can be sampled and burned with the Eprom Blower EPB. The filter settings can be saved in up to 99 kits. The first 16 can be quickly selected by the selector pad. The frame contains a plug for a hihat pedal, exactly the same as the SDS5 pedal. Never, NEVER!!!!! 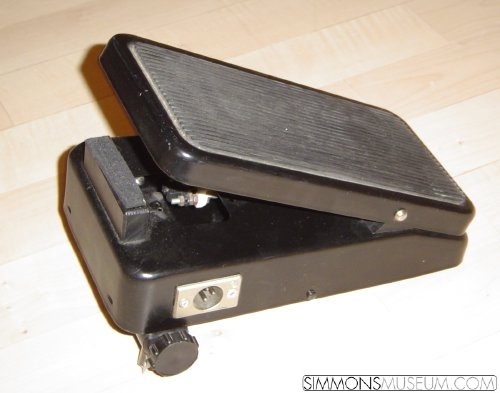 use any other hihat pedal but the original unless you want to melt your pedal! The SDS7 was the successor of the famous SDS5 in 1983 and entered the market as the new Simmons flag ship. But it was difficult to win the race against digital drums competitors like DDrum or Dynacord Add One. The SDS7 electronics did not have an untarnished reputation concerning reliability. At least in the beginning the cards did not fit tight into their sockets so there was always the risk of contact problems which might lead to the total loss of memory or other malfunctions. Techs called the SDS7 the "Simmons cabasa". So if you have the opportunity to get one: Check the memory and the cards. However, the sound is still great and I am looking to do some studio work with it when there's the right project.